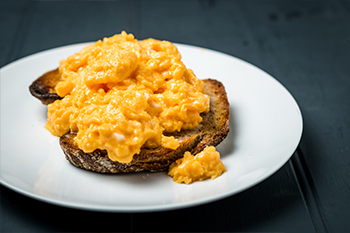 Food writer and home cook Rose Prince beats celebrity chefs to steal scrambled eggs crown. London, Thursday 27th September: The debate that has had chefs in a scramble for centuries was finally settled tonight as the much coveted Clarence Court Crown for the best scrambled eggs method was awarded to Rose Prince. Hosted by food writer and MasterChef critic William Sitwell, prompted by one disappointing breakfast dish too many, the Clarence Court Great British Scrambled Egg Challenge assembled a panel of Britain’s finest chefs and food experts to blind taste eight different methods of cooking up the comforting staple. From the heat of the pan to the type of utensil, no egg was left unturned – or indeed folded or whisked. The food lovers rated each on appearance, flavour and texture whilst debating whether to hold the milk, add dollops of crème fraiche or lashings of cream, whether microwaveable eggs from a bag is ever acceptable and whether or not to break the eggs straight into the pan. In a cracking tie breaker, Rose Prince was crowned winner. Follow Rose’s winning recipe this weekend here.